Windows are not only used to enhance the curb appeal of a home but also to allow for more light and create a focal point in a living room. For most homeowners, windows replacement is considered more like an investment than an expenditure. To this end, it becomes imperative to ensure that all options and styles are effectively explored before a final decision is made. Custom-shaped windows are used to minimize the amount of light that enters the room while maximizing views. These windows which typically do not open to any direction are also referred to as fixed windows or picture windows. Custom-shaped windows are mostly designed for inaccessible areas in the home that usually do not require ventilation, such as the cathedral ceiling, staircase, and some other areas situated directly above windows and doors in the home. Depending on the existing style and aesthetics of your home, you can have these windows built in different geometric shapes and sizes. Custom-shaped and specialty windows are highly recommended for homeowners seeking to create that one-of-a-kind space due to their ability to accent style and add character to any building. Interestingly, these windows have proven to be very efficient at not only extending outdoor views but also allowing more natural light to come into the home. Custom window sizes: Just as their name imply, custom-shaped and specialty windows are obtainable in various sizes. They come in a wide variety of sizes and configurations ranging from circle top to cathedral forms. Interior and exterior colors: When it comes to using custom shape and specialty windows, it is very important to always consider color. Especially, one that will suite the decor of your home. Depending on your home’s design aesthetics, you can choose a variety of matching color options of windows. Decorative grids: for those looking to establish a unique character to their room considering windows with decorative grids may be a viable option. There are various shapes and patterns available for windows with between-the-glass grids. Energy-efficient glass: This type of windows is basically designed to provide adequate protection from the elements. Energy-efficient glass windows are usually available in two major forms which include double-pane glass or triple-pane glass. Custom designer glass: Depending on your ultimate choice, you can have your windows customized with decorative etched glass or privacy glass patterns. 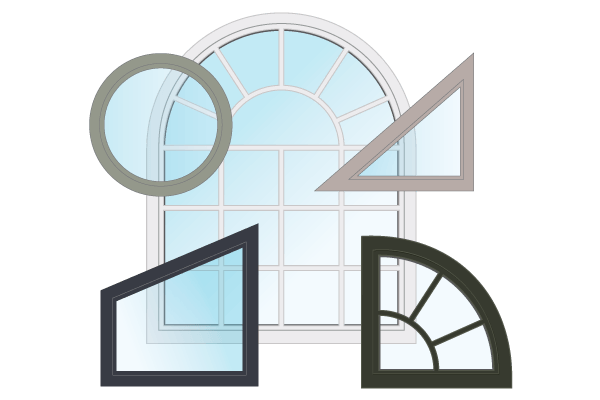 Geometric shapes: As earlier mentioned, custom-shaped and specialty windows come in a variety of shapes. For your maximum personalization, there are over 25 different geometric shaped windows. Discount Windows Inc can install custom-shape and specialty windows in your home. Please contact us for more details.